The Shingletown Medical Center (SMC) would like to share this information to help those that may be dealing with high cholesterol. Cholesterol is made naturally by the liver and is then transported by proteins throughout the body via the bloodstream. It’s an essential building block for cell membranes. It is also necessary for producing hormones, vitamin D, and substances that work to digest fatty foods. However, a person’s lifestyle and genetics can cause their body to produce too much cholesterol. When cholesterol builds up in the arteries, it can block blood flow, which can lead to coronary heart disease, heart attack, or stroke. A healthful diet is one way to help keep cholesterol levels in check. While avoiding foods with high cholesterol content may be beneficial for some the most effective dietary approach to cutting blood cholesterol is choosing foods that contain unsaturated fats over those that contain saturated or trans fats. – Cholesterol carried by low-density lipoproteins, or LDL cholesterol, is dropped off for use throughout the body. Because this kind of cholesterol is prone to building up, it is often referred to as bad cholesterol. – Cholesterol carried by high-density lipoproteins, or HDL cholesterol, works together with its protein counterpart like a garbage truck, collecting extra bad cholesterol from the arteries and bringing it back to the liver to be disposed of. For this reason, it’s referred to as good cholesterol. – Saturated fats are found mostly in meats and dairy products. They signal the liver to produce more bad cholesterol. – Unsaturated fats are found mostly in fish, and plants, such as nuts, seeds, beans, and vegetable oils. Certain unsaturated fats can help increase the rate at which the liver reabsorbs and breaks down bad cholesterol. – Trans fats are solidified vegetable oils, and are usually made through an artificial process called hydrogenation. They are often found in fried, bakery and packaged foods. They not only lead to increased bad cholesterol levels, but also lower levels of good cholesterol. For this reason, they are considered the unhealthiest fats of all. – Trans fat intake, on the other hand, should not just be reduced but cut out completely. In 2013, the United States Food and Drug Administration (FDA) announced that the major commercial source of trans fats, partially hydrogenated oils, were no longer “generally recognized as safe” because of their strong links to coronary heart disease. 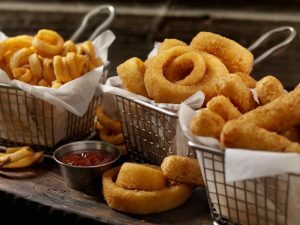 – A national ban on trans fats will begin to be implemented in 2018, and several American cities have already banned them from use in restaurants.